The sun has truly shone on British shores this last week and, while I more than welcome such beautiful weather, it only served to highlight to me how thoroughly unprepared my wardrobe is for the warmer months. Given that I have also just booked a holiday, it's high time that I started purchasing some key pieces for summer. Today, I want to talk to you about one particular online retailer with such a beautiful selection of clothing that I can't help but drool over. That retailer, is Farfetch. If you aren't familiar with them, allow me. Farfetch is the fashion one stop shop, where you can browse designer products from as many as 400 boutiques around the world. José Neves, the Portuguese entrepreneur who founded Farfetch, created the site having a need for independent boutiques to establish a greater online presence in order to boost business. I had to physically tear myself away from looking at this boutique's wares. I fell in love with the Dsquared2 Sleeveless Dress below. It comes in black and white and fits in all of the right places - a perfect number to dress up for summer evenings. 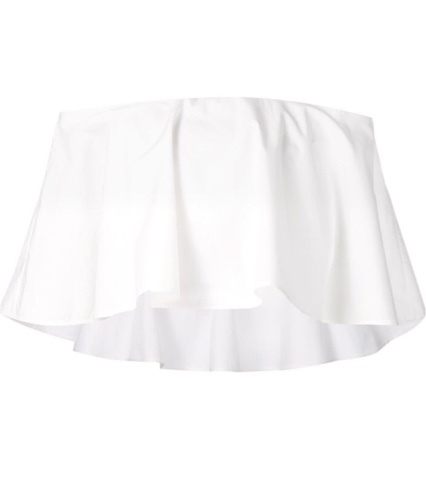 They also had a really cute Diane Von Furstenberg skirt and Michael Kors top - both with the cutest detailing (below). Clothing aside, a girl has got to have some accessories too. 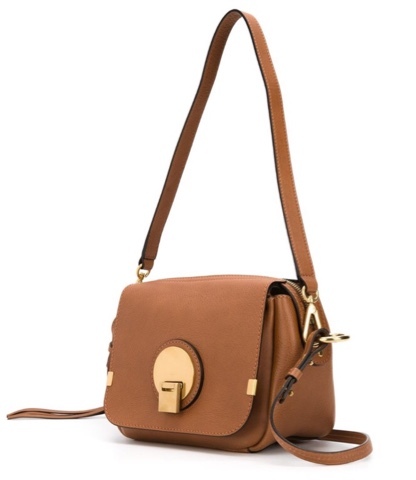 I have listed after a Chloé Faye bag for some time (you can find these on the Farfetch site too), but when I was scrolling through I found their Indy bag. It's a really great size for summer, which is the one time of the year I actually downsize my handbag, and I love the combination of the tan with gold-tone hardware. I am all about floaty fabrics when it gets a bit warmer and I found a gorgeous Chloé top here. I just adore this; the off shoulder cut, the tassels, different patterns and the swingy 70's esque sleeves. It's a definite yes from me. Noticing a pattern at all with this wish list...? I found another delightful off the shoulder blouse from Rosetta Getty. 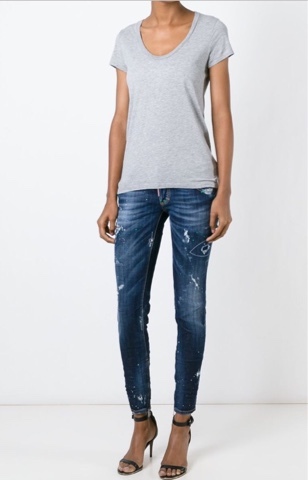 It would look great with tailored shorts (as seen below) or a nice skirt. This boutique had a great selection of denim and I was especially drawn to some distressed skinny jeans, again from DSquared2. They can be dressed up a little with heels as above, or you could take a more casual approach and pair them with flats for a cool daytime look. 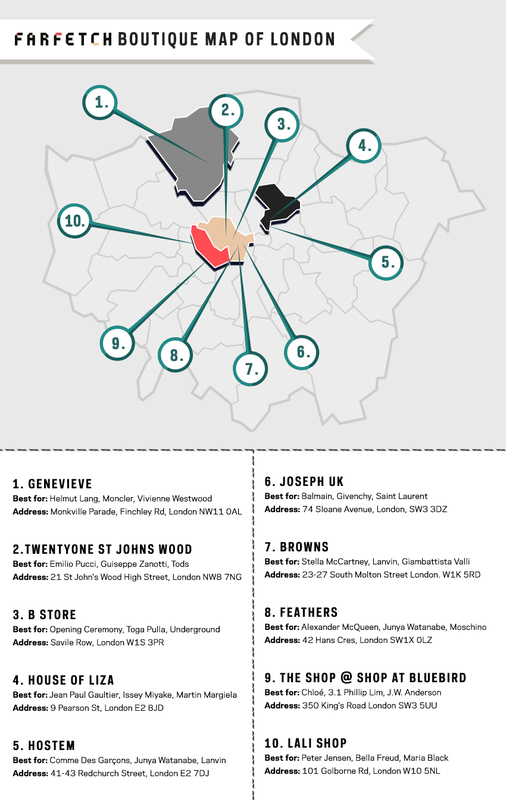 For all of you UK readers, I've included a map below of all of the Farfetch boutiques in London, showing which designers you can expect to find at which store. If you don't fancy leaving the comfort of your own home but want to treat yourself to that special item, however, head over to the Farfetch website. It's so fantastic to be able to have fashion from all different corners of the world right at your finger tips. You can bag also 10% off your first order and I happen to have spotted some great stuff in the sale section if you were hoping to bag a bargain. All photos included in this post are courtesy of Farfetch.com. This blog post is my entry into the Farfetch blogging competition. When I discovered that H&M, one of my favourite fashion retailers, was expanding to include beauty products, I was ecstatic and took myself off sharpish to purchase some goodies and after some thorough testing I can finally share my review! We are fast approaching summer now and, while I have yet to book a sunshine break, one thing I have been a little bit more organised with is my tan. If you caught my previous tan related posts, you will know that for me this comes from a bottle and lately I have been sampling one which I wanted to share with you. 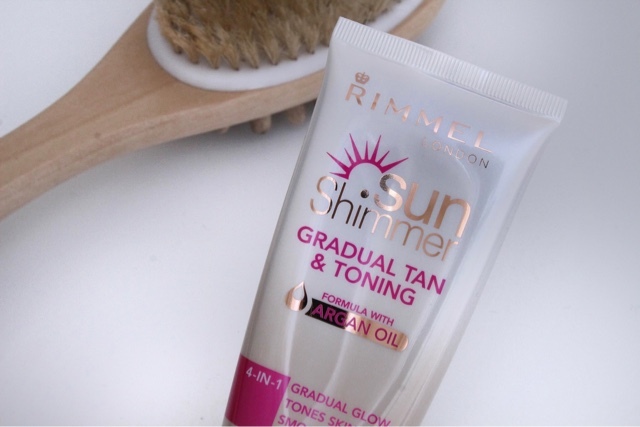 When I began experimenting with tanning products, back in my university days where they fast became my favourite night out accessory, Rimmel was one of the first brands I tried. Having already made my way through their various instant tans in the past, in different shades and finishes, I was thrilled to have their new gradual tan fall through my lettebox to sample. The tan in question, is the Sun Shimmer Gradual Tan and Toning Lotion. 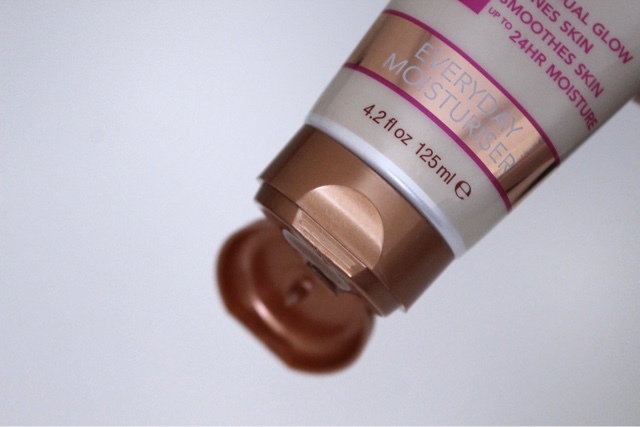 Formulated with argan oil, it’s a 4-in-1 moisturising gradual tan which is designed for daily use. Described as having ‘smoothing benefits’, it is designed to tone skin and leave it moisturised for up to 24 hours. 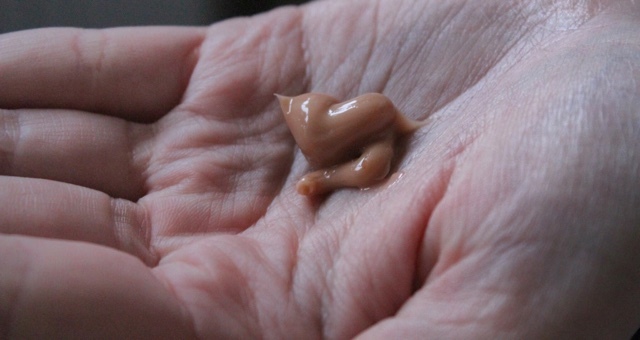 The formula, which is almost caramel in colour, is slightly tinted allowing for easier application. I apply it after showering in place of my usual moisturiser – then admire the results the next morning. My first impressions of this tan was that it gives a really natural glow. Being naturally very pale skinned, I certainly can’t convincingly pull off a deep tan, and this one was really nice and subtle. It gives a really nice base colour, which is easily built up when the tan is reapplied. One thing I did find, was that it did streak a little on the first use. My top tip would be to rub this in thoroughly, in circular motions, ensuring it is fully absorbed into your skin. 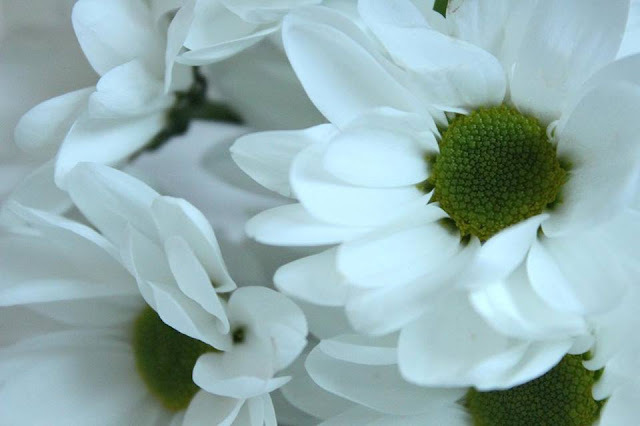 Once dried, it maintains the consistency of a moisturiser and doesn't leave skin feeling sticky - just better nourished. There are quite a few toning tanning products on the market at the moment, and i personally find it hard to judge their effectiveness. Don't be mistaken; these products don't promise abs like ironing boards or thighs of steel. They are, however, supposed to help improve the appearance and elasticity of skin. 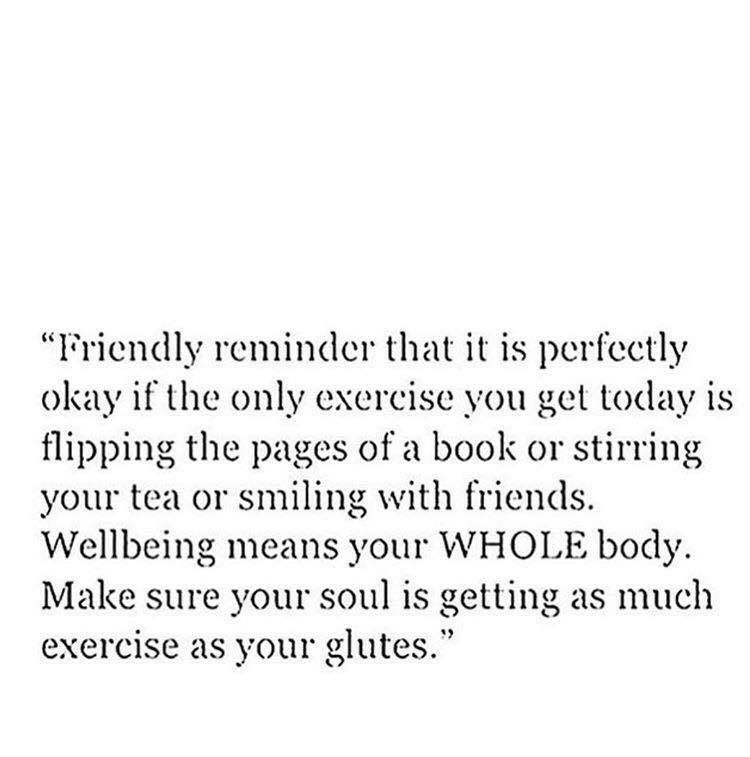 As part of my summer fitness kick, I've been drinking more water and working out harder - both of which have certainly had an impact on my skin. That combined with the fact my skin always looks better with a tan anyway, I'm not really sure if it's anymore toned as a result of the product. That aside, this tan does perform well. It's great for people who are on the go as it slots really easily into your basic beauty routine. Usually priced at £6.99, Boots currently have it on offer online for just £4.99. If you're looking for an easily attainable subtle self tan, I would certainly make the most of this fab deal!